Computer Tune up for $65! How many computers need this service? Would you like to acquire a Maintenance plan? This is the inside of the computer, the part you don't see. Possibly one of the worst things that happens to a computer over time is dust and debris. If it gets inside your computer it can cause premature failures. Common system failures include, dead hard drives, non functional optical drives, mainboard capacitors rupturing and the list goes on. 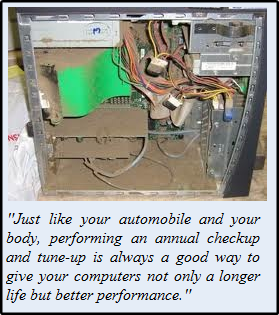 Sign up for a maintenance plan to keep the inside of your computer nice and tidy. We will also complete the other steps to check overall system wide health, see our list below for details. Having the system maintenaced regularly will reduce major repair costs and equipment failures so your system lasts longer and is more efficient. * Review the amount of memory usage, advise on a memeory upgrade if needed.